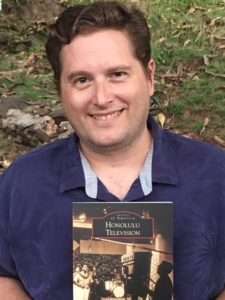 Local broadcast historian AJ McWhorter’s new book, “Honolulu Television,” sums up 65 years of television history in Hawaii, from the first day this state launched a local signal in 1952, to a major change in the TV landscape in 2009 when two affiliates merged into a duopoly. Hot off the press, the 127-page book tells the story of this visual medium most appropriately – using photographs to convey the message. The book, released in December 2017, debuted at number one on Amazon’s new books in the categories of television and video engineering. McWhorter spent a year putting the book together. “Honolulu Television” is sold on Amazon. Screenshot of it charting to #1 the first few days it was up for sale. It’s a labor of love that was borne out of a big change in a different medium: print journalism. It was the fall of 2016, and he had just lost his Honolulu Star-Advertiser column after eight years of penning “Looking Back,” a monthly article that reflected on Hawaii’s media history and personalities. “I still felt I had a couple of years’ worth of columns, and I wanted to express it. I thought, ‘Maybe I should write a book,’” recalls McWhorter. Not one to sit still for long, he quickly found a publisher and sold the proposal. 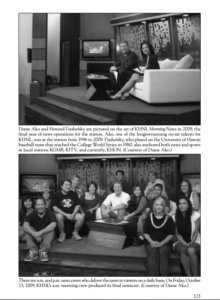 Photos of KHNL’s morning show with Dash & Diane. Our show was the last on air before KHNL merged with KGMB into Hawaii News Now. Bottom photo of morning crew: L to R: Janet Lee, Darin Akita, Carla Young, Mark Shiraishi, Dan Schmidt, Diane Ako, Howard Dashefsky, Dayton Oshiro, Tasha Luke, Lee Richards, Taires Hiranaka, Tracy Gladden, Jessica Hamamoto, Courtney Kono. The book moves chronologically, recounting Hawaii’s television history through wonderful photographs of both places and people; to kids’ programs (I loved Checkers and Pogo) and favorite local shows (my grandfather loved Let’s Go Fishing); and includes a nod to public broadcaster PBS. 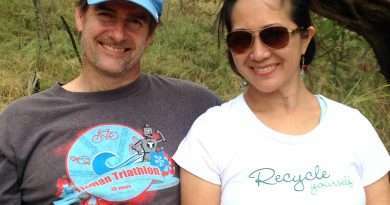 McWhorter, also a former KITV and KHON staffer, spent hours combing various sources for photos, like the Hawaii State Archives, media outlet archives, his own collection, as well as asking friends – like me. 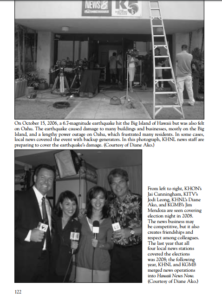 My four photos from KHNL (NBC) made the cut out of over a thousand pictures, and are on pages 122 and 123. As one who has spent most of her career in TV news and much of her life in Hawaii, I love the book. I find it meaningful to look back at shows I grew up with or newscasters I watched as a child. It tickles me to move through the decades and see friends and colleagues – or a few times, myself. McWhorter hopes that his book will take readers on a nostalgic walk down memory lane. “People can look back fondly at a time gone by, when there were just a few stations on the dial and life was so much simpler,” he says. What’s next for McWhorter? 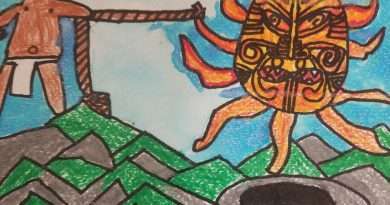 He’d like to turn this book into – what else? – a documentary, and possibly produce a book about Hawaii’s radio history. As we say in the business, stay tuned for that. 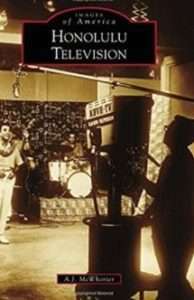 Honolulu Television is available on Amazon at https://www.amazon.com/Honolulu-Television-Images-America-McWhorter/dp/1467127582. It’s also on bookshelves at Barnes & Noble at Ala Moana Center. He’s also in talks to supply the book to Walmart, Target, Native Book & Beautiful Things, Bookends, and Costco.